Like Charles Barkley, I am not a role model. No audio reviewer--and his or her system--should be. Aside from the moveable feast of equipment we reviewers have at our disposal, we often spend more money on our systems than most readers, and therefore we may not perfectly mirror our audience. What we do have in common--in spades--is a love of music and its reproduction, and thus we write and you read--and we all spend our money, perhaps more than we should.
." His gear is engineered to meet a price point and not push the envelope, and what he works to convey is whether or not the built-in compromises matter--do harm to the essence of the music. This is no small task, especially when those around you review big-ticket glamor items that sometimes obscure the gear you're passionate about--some of which may be better anyway. So here's my penance for the reviewing wrongs I've committed: over the past few months, I've diligently put together a budget system that resides prominently in my living room. I'll describe it--and its use--next month except for one part, the subject of this sneak peek: Meadowlark Audio's Kestrel loudspeakers. In addition to Kestrels ($995/pair - see picture above, right), Meadowlark has Herons ($4000/pair - see picture below, right), Shearwaters ($2000/pair), and the Petrel ($700) A/V center-channel speaker in its growing flock. All maintain the chief attributes of the Meadowlark philosophy: transmission-line designs with first-order-crossovers housed in well-built, rigid cabinets. Which means? Well, the claim to fame of transmission-line enclosures is that they extend bass--smoothly and accurately. First-order crossovers preserve the music's original waveform and phase, purportedly imparting a sense of naturalness to the music. The rigid cabinets? They reduce vibration and thus coloration, maximize clarity and soundstaging. Meadowlark is an interesting company that proves talent and persistence do pay off. Pat McGinty, the designer of all Meadowlark products, began by designing and building custom speaker systems for audiophiles in San Diego. Over time, he developed a strong following, and many of his customers bought increasingly expensive and complex systems. So what's a guy to do? He started his own company, which has grown in notoriety chiefly through word of mouth--dealers and customers. With the Kestrel, McGinty wanted to build a speaker that would welcome beginners who love music into the high-end family, and marketing information gleaned from warranty registration cards shows that he's been most effective: 25% of the cards are returned by women, a group of consumers not often pursued by high-end manufacturers. Yes, this is high technology, but you are free to forget it. Grab your honey and dance. After reading through all of the literature on the Kestrels and Herons and having a number of conversations with Pat McGinty, I have come to this conclusion: Meadowlark doesn't quite know that this high-end audio hobby is supposed to be serious business. Good for them. The Kestrels are cuties: 36" tall and beautifully veneered. They have a 6.5-inch woofer and a 1-inch fabric-dome tweeter. McGinty uses only non-metal dome tweeters. "Are there others?" he asked me coyly, knowing full well the inherent nasties that come with a good number of metal-dome jobs. 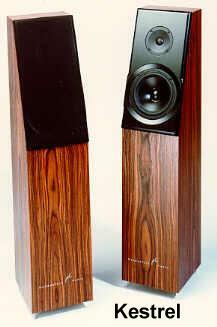 The Kestrels' cabinets are very solid--surprisingly so given the price of the speakers. Knock, knock, knocking on them produces only quick, dull thuk sounds. The internal parts are top-notch: high-quality polypropylene capacitors and heavy-gauge air-core inductors, all soldered by hand. The Kestrels also have heavy gold-plated 5-way binding posts and include sets of hardened spikes for coupling the speakers to the floor. And as a final act of quality control, McGinty himself listens to each pair before it ships--an audiophile-approved act of kindness. Smoooootch. The fine details of the Kestrels belie their modest price and impart a great appreciation for the amount of thought that went into their creation. In fact, many of the Kestrels' design elements pull double-duty, performing their intended functions while enhancing others. The inert cabinet, for instance, is braced heavily by cross members that in turn create the transmission line. The cabinet also includes a false bottom, so that the crossover is housed outside the chamber to eliminate any sort of microphonics or microvibration. The baffle, which is elastically decoupled from the rest of the cabinet by a layer of proprietary damping material, is slanted to time-align the drivers and their output. Furthermore, its edges are smoothly rounded to control diffraction. The tweeter has a conical face place to methodically control dispersion and thus reduce room reflections--especially those that come from the floor. And the grille is frameless: it simply slips into a channel around the baffle. Whew! Let me spell out the obvious: the Kestrel is a precision-designed loudspeaker, the antithesis of some speakers which are more prototype and promise than finished product. Is the sound of the Kestrels for the birds? Grab your mouse and click Reload--next month. For me, and I'm sure you, listening to music is an experience: something done actively and with deliberation--gusto! And chances are our similarities don't end there. We may both have extensive and expensive systems that have rooms of their own. We may have tube electronics that we turn on and warm up before use--let ripen, if you will--or we may own solid-state gear that we keep on all the time, at the ready for play. We may have special racks to hold our equipment, and we may have soundly treated our sound rooms with doo-dads meant to enhance realism. No, for us listening is not something done casually, although hopefully it's not something so burdened with ritual that it has lost some, or all, of its enjoyment. Putting together a second, more modest system for use in a more accessible area of my house (my living room, amongst the bookcases, sparse furniture, TV and cats) has helped me identify some of the pitfalls that can plague this hobby. Believe me, I'm not complaining about my ProAc/ Quicksilver/ CAT/ Timbre/ Wadia rig. It's just that sometimes all I want to do is sample some music while I go through the mail or cook dinner--not sit in a special room, in audiophile-approved darkness, and listen critically. Yes, I suppose I could move my reference rig into the living room, but then I couldn't indulge the audiophile side of myself that enjoys the tweaking and isolation. You can't please everyone, especially yourself. So what's this new system about? All digital and transduced (?) 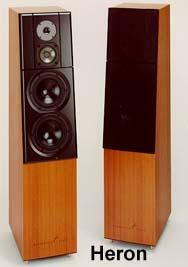 with a pair of Meadowlark Audio Kestrel loudspeakers (the subject of this review, by the way). Courtesy of Bruce Jacobs at Salon One Audio, I drove the Kestrels with a Conrad-Johnson MV55 amplifier, preamplification duties handled by a Reference Line Preeminence One passive linestage. I must mention here that I think both of these products are superb--especially the C-J amp, which had more than a cup of coffee with my ProAc Response 4 speakers (call it a pot, ha!). The digital source was a Panasonic LX-200 laserdisc/CD player, a remnant from my short-lived interest in home theatre. It's nothing special as far as sound goes, but I had it on hand and its original list price ($850) fit nicely with the rest of the equipment du jour. I used Kimber PBJ interconnects and FMS ESP II speaker cable--the latter also courtesy of Salon One. Now I know what some of you are thinking: is all of this gear "modest"--especially the C-J amp which lists at $1995, or roughly twice the price of the Kestrels? I have no reasonable explanation except that I had to take what I could get (and live with). I ask you, who among us would turn down a C-J tube amp when one is offered for use? Yeeeaaahhh, I thought so. Before I could evaluate the sound of the Kestrels, I had to establish baselines for all of the new equipment I was using. So, one by one, I put each new component into my reference system to isolate its sound. When I inserted the Kestrels, I was immediately pleased. No, they weren't a match for my ProAcs, but the two did compare favorably in one broad way: both deliver the music straight up, without excessive audiophile adornment. The Kestrels will not make your poor recordings unlistenable, a true gift to those of us whose collections are plagued with marginal recordings of--of all things--great music. And along with this tendency, the Kestrels are not speakers that will spotlight the warts in your system, and this is a blessing given that they likely won't be driven with Quicksilver M135s or perhaps even a Conrad-Johnson MV55 (although this is a lovely pairing). Thus, I can imagine that the Kestrels will fit in wherever they're used: at the business-end of a mass-produced receiver, as replacements for the speakers that came with a rack system of adequate power, or with components of true high-end pedigree. All of my reference CDs, those I use to gauge the performance of a new piece of equipment, were wonderful with Kestrels. Television's 1992 eponymous return to the studio is a disc I use to judge soundstaging--and listen to for pure enjoyment. Through the Kestrels, the space around Tom Verlaine's sublime guitar work was as I'd always heard it: present, an entity unto itself, almost a part of the band. Like many smaller speakers, the Kestrels have the innate ability to melt into the music they reproduce, making it infinitely easier to become involved, connected. Of course, the music itself has a little to do with it--OK, it has a lot to do with it. But the Kestrels help it all along. Probably the element of the Kestrels' sound that I was most surprised by was their bass. From experience, I know the standard MO of most speakers in the sub-$1000 price range: mounted on stands that visually signal the absence of foundationary growl, testicular fortitude--call it what you will. The Kestrels, however, break the mold. They require no stands of course, and their bass is definitely not a casualty of their price. They can bring rock to life, or as their designer Pat McGinty boasted, "They can swing." I like to use John Mellencamp's Dance Naked, especially his cover of "Wild Night" with Me'Shell Ndegeocello, to get a sense of a speaker's ability to move air. The Kestrels can't reach the depths of the ProAc 4s (surprise! ), or equal the low-end output of any other speakers I've had in my listening room in the last few years (Mirage M-3sis, Thiel 3.6es, ProAc 3.5s, Aerial 10Ts, et. al. ), but they do have bass that's delicate or articulate or apparent or absent when the music calls for it. I've heard "woe, great bass" that's been nothing more than a sound effect, and although I own ProAc Response 4s mostly because I couldn't live with the bottom end of the Response 3.5s, I equally can't live with speakers whose claim to fame is their ability to reproduce the thundering footsteps of dinosaurs. Music is real, and the Kestrels will only remind you of this. Besides, for under a thousand smackers you're lucky if your speakers can reproduce a bit of gastrointestinal distress with any sort of realism. So make sure your listening seat is upwind from the Kestrels--or whew! Faults? Only those that appear in comparison to speakers that cost a lot more. Some listeners may find the Kestrels to be too polite (not me), while others may find that they don't light up enough of the soundstage (not me), and yet others may accuse them of having weak bass (again, not me). Think of it this way: the Kestrels are much more than 1/18th as impressive as my $18,000 ProAc Response 4s, certainly more than 1/6th of the Aerial 10Ts, and I'll bet closer in sound quality to many more expensive speakers than some of us would be willing to admit. The law of diminishing return applies heavily to high-end audio: it will cost you more for the last 10% of ultimate performance than it will for the first 50%. Keep this in mind as you audition the Kestrels--and determine how far down the high-end highway you want to go. What would one of my reviews be without a guest appearance from audio confident and all-around good guy Grant? As he did with the Clayton amps I reviewed last summer, Grant did the dirty work of breaking in the Kestrels. He did this while I was working to scare up some ancillary equipment for the review--and because he's an inquiring audio mind. In addition to his reference rig, Grant also has an all-Adcom-electronics-with-Advent-speakers living-room system, the kind of rig I thought the Kestrels would thrive in. And so they did. Grant--and his wife--loved the Kestrels, finding them far superior to the bulkier Advent floorstanders in every way, including bass. He also found that they presented musical detail in a natural way--detail that his Advents just couldn't find no matter how hard they looked. We both agreed that if the Kestrels were double their price--or more--we'd still admire them, but we'd have a harder time being outrageously enthusiastic about them. At $995 a pair, they're a no-brainer: just put them in place and jump off the high-end treadmill--and perhaps retire a little earlier. How do you spend your money? Or more specifically, what do you buy with your disposable income and how important are your purchases? I've been pondering these questions for years--not coincidentally, the exact number of years that I've been interested in building a great high-end audio system to enhance my enjoyment of recorded music. Any fool would want think it all over, especially given the price of high-end equipment these days. Yes, my reference system cost me more than my car--considerably more--but I would argue that it means more to me. And no, I don't want to start taking the bus, but I also refuse to give up my music--unless my financial livelihood depends on it, in which case my musicless dilemma will be the least of my problems. When I first decided to do this review--and thus put together a second audio system--I had humble expectations: music on a scale of enjoyment and involvement proportional to the amount of money the entire system would cost. I am, therefore, delighted to report that my budget system, fronted by the Meadowlark Kestrels, has been a great success. The Kestrels deliver more than a small helping of high-end meat and potatoes, and for dessert they offer a sweet tonal balance and chewy bass. They draw you into the music--like a fine high-end product should--and given their build quality and sonic strengths, their price seems absurdly low. Listen to a pair--and be ready to soar.